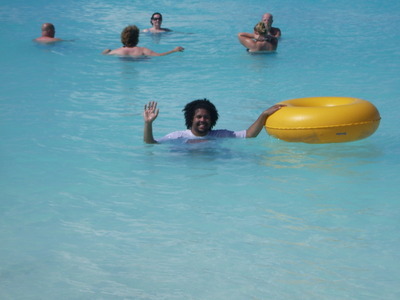 At our first port of call (Grand Turk) during our honeymoon (Oct. '09) my husband and I hit the beach for some swimming. After we got out of the water he looks down at his bare ring finger and says "Oh 'shoot,' my wedding ring!" We sadly walked back to the beach so he could look around the water for it. I'm not a pessimistic person, but I told him to just forget about it. His ring came off in the Atlantic Ocean, what are the chances of finding a ring in the Atlantic Ocean? He went in the water to look, and I laid back in a beach chair to relax. About 15 minutes later I hear him exclaim "I found it!" and I look up to see him holding the ring in his hand with a smile on his face. He is a very determined man, and that's part of why I love him. The moral of the story? When something seems impossible, and everyone is telling you to give up... keep pressing on, you can find your ring in the sea. Great story!!! I had a mini-freak out every time, I misplaced my marriage rings. i am always paranoid about losing my ring. when i first got married, it was a little loose and I was terrified I would lose it, I was always taking it off whilst washing up, bathing etc. I was even subconsciously eating more so I could fill out - lol!